While the Samsung Galaxy S8 and Galaxy S8+ are now a bit over 1 year old, they remain powerful and attractive smartphones. If you're thinking of purchasing any of these two ex-flagship handsets unlocked, Best Buy has a deal that should interest you. 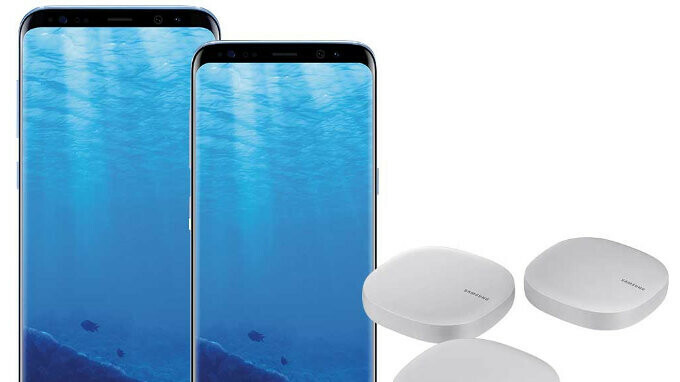 The giant retailer is offering a free Samsung Connect Home AC1300 Mesh Wi-Fi System (3-pack) with both phones. Normally costing $299, the 3-pack Samsung Connect Home AC1300 Mesh Wi-Fi System is built to optimize Wi-Fi signal in your home, in addition to working as a smart home hub - allowing you connect and manage compatible voice assistants, cameras, lights, and other devices. We'd say this is definitely not a bad product to receive for free. Best Buy is currently selling the unlocked Samsung Galaxy S8 for $599.99, and the unlocked Galaxy S8+ for $689.99 - these are the exact same prices that you'll find in most places in the US. Both Galaxy smartphones are available in two color variants: black and coral blue. Best Buy lets you save $50 on any unlocked S8 model, but only with immediate activation on Verizon Wireless (new line or new account required). These deals look like dumping prices...just buy from them whatever their loss. But it actually means that the real prices for these handsets are much lower than the MSRP. Who cares, unlike you, us consumers, love these promotions. Android devices always have more/better promotions than Apple. (Not starting fanboy wars, just stating it as a good thing). Then why bring up Apple in the first place? I’m not gonna dance around just because some of you get triggered by words like Apple and android or Samsung. Deal with your own problems. I just didn’t want to be misunderstood. Not sure what you love...the ripoff of paying $700+ for an S8 most of the year (minus these small bones thrown to their customers a few days a year) when you know that the real price is much lower ? No different then BOGO deals on iPhones. Guess you can say the same.